Cody Ray Allen Garbrandt (born July 7, 1991) is an American professional mixed martial artist signed to the Ultimate Fighting Championship (UFC). He is a former Pinnacle FC fighter and the former UFC Bantamweight Champion after becoming only the second fighter to defeat Dominick Cruz at UFC 207 handing him his first defeat in almost a decade. As of March 4, 2019, he is ranked #6 in the official UFC bantamweight rankings. Garbrandt was born and raised in Uhrichsville, Ohio. He began boxing at the age of 15, trained by his uncle, who was an Olympic alternate in the sport. At Claymont High School, Garbrandt competed in wrestling and football, winning a state championship as a freshman in 2007, by defeating Zach Neibert, 4-2, and was a runner-up in 2008 (getting pinned by Zach Neibert in 2:44). Garbrandt was also a Senior National All-American in 2010, but ultimately turned his focus to boxing over wrestling. In football, Garbrandt won All-State honors as a linebacker during his junior season. Despite not competing in wrestling during his final two years of high school, Garbrandt attended the national tournament as a senior and placed fifth, receiving interest from several Division I schools. Garbrandt briefly attended two NCAA Division II schools, Newberry College and Notre Dame College, before dropping out for academic reasons. As an amateur boxer, Garbrandt compiled a 32-0 record. At the same time Garbrandt furthered his amateur MMA career, taking his first bout in 2009. He competed in several amateur fights in his native Northeast Ohio before turning professional in 2012. Cody is an avid outdoorsman. Garbrandt compiled an amateur MMA record of 6-2 before making his professional debut in 2012. His pro record currently stands at 11-3, with nine of his opponents being finished via strikes. Prior to his finish of James Porter in May 2014, he moved from Ohio to Sacramento, California to train at Team Alpha Male in an attempt to further his career. On the heels of a first-round finish of Charles Sanford in October 2014, he signed with the Ultimate Fighting Championship in the fall of 2014. Garbrandt made his promotional debut against Marcus Brimage on January 3, 2015, at UFC 182. He won the fight via TKO in the third round. Garbrandt faced Henry Briones on July 11, 2015, at UFC 189. He won the fight by unanimous decision. Garbrandt was expected to face John Lineker on February 21, 2016, at UFC Fight Night 83. However, Lineker pulled out of the fight during the week after contracting Dengue Fever and was replaced by Augusto Mendes. Garbrandt won the fight via TKO in the first round. Garbrandt faced fellow undefeated prospect Thomas Almeida on May 29, 2016, at UFC Fight Night 88. He won the fight by knockout in the first round and also earned a Performance of the Night bonus. Garbrandt next faced Takeya Mizugaki on August 20, 2016, at UFC 202. He won the fight via TKO in the opening minute of the first round. Garbrandt faced then-Bantamweight Champion Dominick Cruz on December 30, 2016, at UFC 207. He became champion, winning the fight by unanimous decision after dropping Cruz on multiple occasions and nearly finishing him in the fourth round. Both participants were awarded Fight of the Night for their performance. In January 2017, the UFC announced that Garbrandt would be one of the coaches on The Ultimate Fighter 25 opposite former UFC Bantamweight champion (and former Team Alpha Male teammate) T.J. Dillashaw, with the two expected to face each other on July 8, 2017, at UFC 213. However the bout was scrapped on May 23 after Garbrandt sustained a back injury. The bout was rescheduled and eventually took place on November 4, 2017, at UFC 217. Garbrandt lost the fight via knockout in the second round to lose the UFC Bantamweight Championship. This was his first loss in professional MMA. Garbrandt faced T.J. Dillashaw in a rematch for the UFC Bantamweight Championship on August 4, 2018, at UFC 227. He lost the fight via TKO in the first round. In April 2019, T.J. Dillashaw relinquished the title after testing positive for erythropoietin. Garbrandt made his return against Pedro Munhoz on March 2, 2019 at UFC 235. He lost the fight via knockout in the first round. Despite the loss, Garbrandt received his second Fight of the Night bonus award. 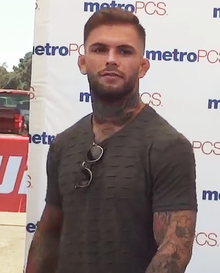 On May 8, 2018 Garbrandt's autobiography was published, titled The Pact. The book details the life of Cody Garbrandt, and explains his deep connection, and completed promise, with young Leukemia survivor Maddux Maple. The book also chronicles the story of Garbrandt's young life in the Appalachian region of Ohio and his early fight with drugs to the story of his reign as UFC Bantamweight Champion, and how he brought his friend Maddux Maple along with him for the whole journey to make good on their pact. During Garbrandt's run with the MMA promotion Pinnacle FC, he met and began dating a woman named Danny Pimsanguan. The couple eventually married in July 2017. In October, the couple announced they were expecting their first child. In March 2018, the couple announced the birth of their son, Kai Fisher Garbrandt. 2016 Rising Star of the Year. Loss 11–3 Pedro Munhoz KO (punches) UFC 235 March 2, 2019 1 4:52 Las Vegas, Nevada, United States Fight of the Night. Win 11–0 Dominick Cruz Decision (unanimous) UFC 207 December 30, 2016 5 5:00 Las Vegas, Nevada, United States Won the UFC Bantamweight Championship. Fight of the Night. Win 9–0 Thomas Almeida KO (punches) UFC Fight Night: Almeida vs. Garbrandt May 29, 2016 1 2:53 Las Vegas, Nevada, United States Performance of the Night. Win 8–0 Augusto Mendes TKO (punches) UFC Fight Night: Cowboy vs. Cowboy February 21, 2016 1 4:18 Pittsburgh, Pennsylvania, United States Catchweight (142 lbs) bout; Mendes missed weight. Win 2–0 Shane Manley KO (punches) Pinnacle FC: Pittsburgh Challenge Series 5 November 27, 2013 1 3:57 Canonsburg, Pennsylvania, United States Featherweight bout. ^ a b "UFC Profile". ^ "Fighter Rankings | UFC ®". UFC. Retrieved 2019-03-05. ^ "No Dad! Cody Garbrandt talks tattoos, boxing, and mentality ahead of UFC 182 debut". MMAmania.com. Retrieved 2015-10-15. ^ "Wrestling: 2007 DIVISION II RESULTS". ohsaa.org. Retrieved 2017-01-19. ^ "Wrestling: 2008 DIVISION II RESULTS". ohsaa.org. Retrieved 2017-01-19. ^ a b Sneed, Brandon. "Cody Garbrandt Is Living the Dream: How UFC's New Stud Got His Superpower". ^ Brett Okamoto (2015-01-01). "Rocky path for Garbrandt to UFC debut". espn.go.com. Retrieved 2015-01-01. ^ a b Kyle Nagel (2014-05-23). "Fight Path: Cody Garbrandt goes from small-town Ohio to Team Beta Males". mmajunkie.com. Retrieved 2014-05-23. ^ a b Zane Simon (2014-11-22). "Welcome to the UFC, Cody Garbrandt". bloodyelbow.com. Retrieved 2014-11-22. ^ Staff (2014-11-22). "Marcus Brimage meets newcomer Cody Garbrandt at UFC 182 in Las Vegas". mmajunkie.com. Retrieved 2014-11-22. ^ Steven Marrocco (2015-01-03). "UFC 182 results: Cody Garbrandt impresses in debut, stops Marcus Brimage". mmajunkie.com. Retrieved 2015-01-03. ^ Matt Erickson (2015-04-10). "Henry Briones vs. unbeaten Cody Garbrandt on tap for UFC 189 in Las Vegas". mmajunkie.com. Retrieved 2015-04-10. ^ Steven Marrocco (2015-07-11). "UFC 189 results: Cody Garbrandt outstrikes Henry Briones for unanimous decision". mmajunkie.com. Retrieved 2015-07-11. ^ Staff (2015-12-14). "Garbrandt vs. Lineker added to UFC Fight Night 82". mmajunkie.com. Retrieved 2015-12-14. ^ Guilherme Cruz (2016-02-15). "John Lineker out of UFC Fight Night 83 due to illness". mmafighting.com. Retrieved 2016-02-15. ^ Michael Stets (2016-02-21). "UFC Fight Night 83 results: Cody Garbrandt clocks Augusto Mendes, scores nasty first round finish". mmamania.com. Retrieved 2016-02-21. ^ Hunter A. Homistek (2016-03-18). "Cody Garbrandt vs. Thomas Almeida targeted for UFC Fight Night 88 main event in Las Vegas". mmafighting.com. Retrieved 2016-03-18. ^ Steven Marrocco (2016-05-30). "UFC Fight Night 88 results: Cody Garbrandt lays waste to Thomas Almeida for first-round KO". mmajunkie.com. Retrieved 2016-05-30. ^ Jesse Holland (2016-06-21). "Cody Garbrandt vs Takeya Mizugaki in the works for UFC 202 on Aug. 20". mmamania.com. Retrieved 2016-06-21. ^ Ben Fowlkes (2016-08-20). "UFC 202 results: Cody Garbrandt's latest gem? 48-second KO of Takeya Mizugaki". mmajunkie.com. Retrieved 2016-08-20. ^ Damon Martin (2016-10-20). "Dominick Cruz vs. Cody Garbrandt targeted for UFC 207". foxsports.com. Retrieved 2016-10-20. ^ Brandon Wise (2016-12-31). "UFC 207 results: Cody Garbrandt takes bantamweight title with swagger, tenacity". cbssports.com. Retrieved 2016-12-31. ^ Tristen Critchfield (2016-12-31). "UFC 207 bonuses: Nunes, Garbrandt, Cruz, Garcia receive $50K awards". sherdog.com. Retrieved 2016-12-31. ^ Nick Baldwin (2017-01-17). "Cody Garbrandt and T.J. Dillashaw to coach The Ultimate Fighter 25: Redemption". bloodyelbow.com. Retrieved 2017-01-15. ^ Damon Martin (2017-04-09). "Cody Garbrandt vs. T.J. Dillashaw confirmed as co-main event for UFC 213". foxsports.com. Retrieved 2017-04-09. ^ Tristen Critchfield (2017-05-23). "UFC 213 update: Garbrandt vs. Dillashaw scrapped; Romero-Whittaker interim title bout set". sherdog.com. Retrieved 2017-05-23. ^ "UFC 217 results: T.J. Dillashaw finishes rival Cody Garbrandt to reclaim 135-pound title". MMAjunkie. 2017-11-05. Retrieved 2018-08-12. ^ Al-Shatti, Shaun (April 5, 2018). "T.J. Dillashaw vs. Cody Garbrandt 2 slated for UFC 227". MMA Fighting. Retrieved 2018-04-07. ^ "UFC 227 results: T.J. Dillashaw does it again, stops Cody Garbrandt in wild opening round". MMAjunkie. 2018-08-05. Retrieved 2018-08-05. ^ "Ex-champ Cody Garbrandt returns vs. Pedro Munhoz at UFC 235". MMAjunkie. 2019-01-07. Retrieved 2019-01-07. ^ "Ex-champ Cody Garbrandt knocked out trading punches not unlike previous fights". ^ Staff (2019-03-03). "UFC 235 bonuses: Johnny Walker, Diego Sanchez among $50,000 winners". mmajunkie.com. Retrieved 2019-03-03. ^ "The Pact". Cody Garbrandt. 2017-10-12. Retrieved 2018-09-15. ^ "Meet the 11-year-old cancer survivor who inspired a UFC star". New York Post. 2017-10-28. Retrieved 2018-09-15. ^ Kowal, Eric (October 2, 2017). "Cody Garbrandt announces he and wife are expecting first-born child". MyMMANews.com. Retrieved 2018-08-03. ^ Juneau, Jen; Leon, Anya (March 29, 2018). "UFC Champion Cody Garbrandt Welcomes Son Kai Fisher". PEOPLE.com. Retrieved 2018-08-03. ^ "Pundit Arena's 2017 UFC Awards - Pundit Arena". www.punditarena.com. Retrieved 2018-01-03. This page was last edited on 22 April 2019, at 17:48 (UTC).